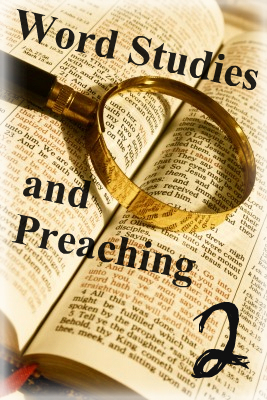 This week we are pondering the specific skill of word study in preaching. Today I’ll focus on identifying key terms, then tomorrow we can consider the actual processes involved. So how do you identify words to define more carefully? 1. Prayerfully read and study the passage. Sounds silly, but until you get some decent familiarity with the passage, you can’t start identifying words. 2. Recognize that not every word is equal. All words are equally inspired, but not all words are equal in a passage. You might assume this is obvious. After all, a weighty word like justified or righteous must be worth studying, while a normal word like in or of is obvious, right? Sometimes wrong. A “weighty” word may not be a key term in a particular passage (it may be given in the build up to the point of a prayer, for instance), while an obvious word may be the key to the whole section. 3. Recognize that your time is restricted. It would be great to do a full chase on every term in a passage. Actually, hypothetically it might be great in your study phase, if you had infinite time. But in reality studying every word equally will distract you from the force of the passage in your study, and it will certainly confuse people in your preaching. For instance, in Ephesians 1:15-23, I would cover the first 47 words fairly briefly. Why? Because I want the focus to be on the point of the passage, which is what Paul is actually praying from the end of v17 onwards. If I give detailed explanations of faith, Lord, love, saints, prayers, God, Father and glory in my sermon, people will be numb by the time I get to Paul’s actual request. So how to identify key terms? B. Look for structurally important terms. Down in verse 8, grace was given to Paul with the results being the rest of verses 8-10. C. Look for key connections or little words. In this passage, the as, of verse 5 feels significant when the passage is read carefully (even better, when the passage is broken down to a phrase by phrase structural outline, or disagrammed if you have that skill from Greek). Incidentally, once you start looking at the structure of epistle text like this, a good formal translation needs to be the working text, not a dynamic equivalent text. D. Look for key terms in the wider context. A term may only be used once in the passage, but be critical in the flow of the book. For example, stewardship in verse 2 is important in the flow of Ephesians 1-3. E. Look for key terms that are missed by the other guidelines. Here’s the catch all. It forces you to keep looking and observing the text. In this case, it allows you to notice that glory in verse 13 is massively significant. Doesn’t look it structurally, but actually Paul digressed in verse 1, so completing that thought in v13 is a big deal here.